Nobel Prize-Winning Author Gabriel Garcia Marquez Dies At 87 : The Two-Way The Colombian-born author of One Hundred Years of Solitude had been in failing health for some time. 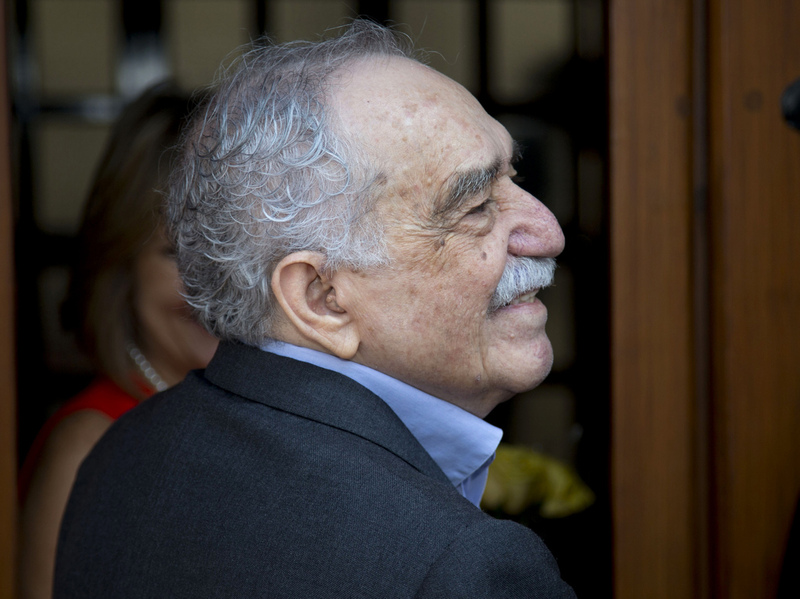 Nobel literature laureate Gabriel Garcia Marquez greets fans and reporters outside his home in Mexico City on March 6, his birthday. Nobel Prize-winning Colombian novelist Gabriel Garcia Marquez, author of One Hundred Years of Solitude, has died in Mexico City. He was 87. "Garcia Marquez's magical realist novels and short stories exposed tens of millions of readers to Latin America's passion, superstition, violence and inequality. "Widely considered the most popular Spanish-language writer since Miguel de Cervantes in the 17th century, Garcia Marquez achieved literary celebrity that spawned comparisons to Mark Twain and Charles Dickens. "His flamboyant and melancholy works outsold everything published in Spanish except the Bible. The epic 1967 novel One Hundred Years of Solitude sold more than 50 million copies in more than 25 languages." "A cause of death was not immediately announced, but Garcia Marquez had been in failing health for some time. He was released from the hospital just over a week ago. "Garcia Marquez's death represents the passing of one of the world's greatest living authors, and the loss of a powerful public intellectual whose opinions on Cuba, military dictatorship and Latin American cultural autonomy made front-page news. "The news was met with an outpouring of grief and reverence for the writer known to his admirers simply as 'Gabo,' and who was often compared to Hispanic literature's other titan, 'Don Quixote' author Miguel de Cervantes. More than any other author, Garcia Marquez fueled the post-World War II popularizing of Latin America literature known as the 'Boom.' "
NPR's Mandalit Del Barco has a more detailed portrait of the author and his life here. In a statement, President Obama said of Garcia Marquez: "I once had the privilege to meet him in Mexico, where he presented me with an inscribed copy that I cherish to this day. "As a proud Colombian, a representative and voice for the people of the Americas, and as a master of the 'magic realism' genre, he has inspired so many others – sometimes even to pick up the pen themselves," the president said.